"You learn how to dissect a frog, which is wonderful. But wouldn’t it be good to know how to balance my checkbook?" You would be far from the only one asking. “What is financial literacy?” was the second-most-searched finance question in the past year, according to data from Google. Financial literacy refers to a degree of financial education or know-how, or a basic understanding of money and how it works. “Financial literacy is having the education, information, and tools that will empower you to make the best financial decisions for whatever stage of life you’re in,” says Justin Halverson, a partner and cofounder of Minnesota-based financial planning firm Great Waters Financial. Unfortunately, many Americans struggle when it comes to understanding their finances, an issue that experts say is largely because we don’t learn about the topic in a formal way. Fewer than 20 states require some sort of financial education component for students to graduate from high school. Schools often aren’t focused on teaching practical financial skills, Halverson says. “You learn how to do calculus, which is great, and you learn how to dissect a frog, which is wonderful. But wouldn’t it be good to know how to balance my checkbook? Or not get into credit card and student loan trouble?” says Halverson. Once you’re out of school and navigating these issues in real time, it’s not always easy to learn as you go. Financial products can get complicated. There’s a lot of jargon. And professionals in the industry aren’t always required to work in your best interest. “Unfortunately, many financial professionals operate in silos, or speak in such a way that finance is essentially its own language,” says Smith. “It can be confusing for most people and families to understand what they own and how it all works together. “It leads to costly inefficiencies and missed opportunities,” he says. 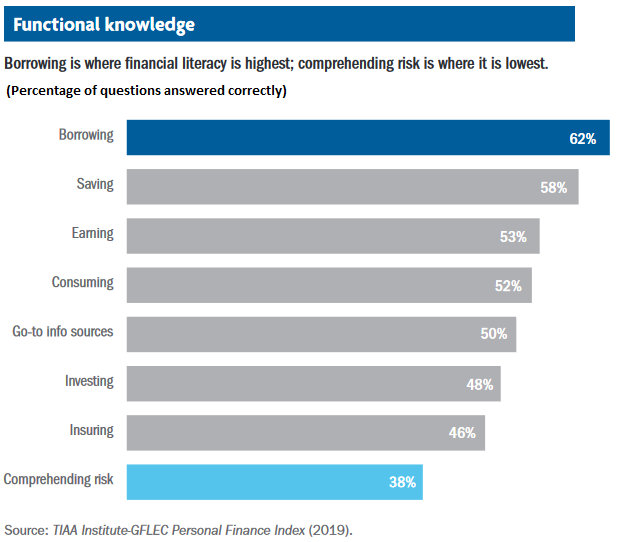 In one measure of financial literacy, the TIAA Institute-GFLEC Personal Finance Index, adults were able to correctly answer an average 51% of basic personal finance questions. They were most likely to score on questions about borrowing and debt, and least able to answer questions about risk and uncertain financial outcomes. If you want to increase your own level of financial literacy, there are a few key concepts to focus on. Typically, those include money management and budgeting, saving, investing, debt, and retirement planning. There are numerous places you can take a basic personal finance class, including local colleges or universities, community centers, and even churches. Pay attention to who is sponsoring the class, though—that can help you avoid one that’s really trying to sell you on a particular product. There are tons of websites, videos, and tutorials available for free. Again, watch out for sources with sales-focused agendas. Ask for advice from people in your life who are financially successful. And learn from the mistakes that others, such as friends and family, have made.